Photographs by Hh co-founder CK Anderson, New York City. 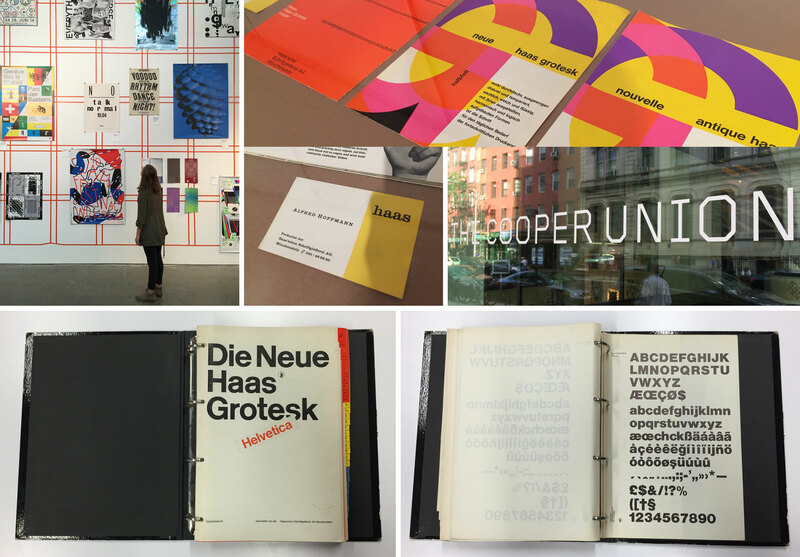 Swiss Style Now, a 2016 exhibition in the main gallery at New York City’s Cooper Union, included not only contemporary Swiss designers, but also a few retrospective pieces related to our favorite typeface, Helvetica. Like the first pamphlet, designed in 1958, promoting Neue Haas Grotesk (as Helvetica was called prior to 1960), and an oversized business card for Alfred Hoffman, son of Helvetica father Eduard Hoffman, who began working for the Haas Type Foundry in 1951. He retired in 1989. Even more rare is the Neue Haas Grotesk specimen book designed in 1960 by famed Swiss designer Josef Müller-Brockmann. Back in the day, when designers actually used math when working on page layouts, specimen books consisted of pages of dummy text organized according to different point sizes and leadings.